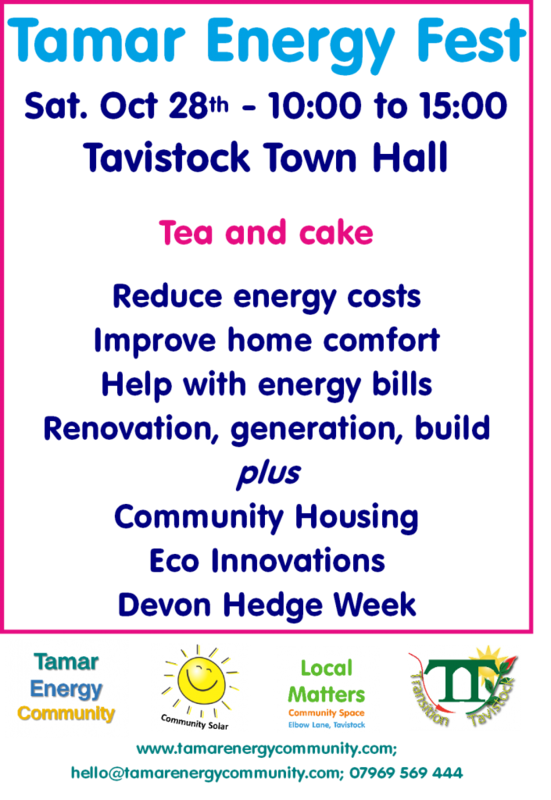 Come and join us for a fun and informative day for all the family, all about energy, in Tavistock Town Hall from 10:00 to 15:00. Find out why Local Energy Matters … and how you can reduce your energy costs. Help us promote the event? You can download the flyer here. This entry was posted in Energy, Events/Meetings, News on October 20, 2017 by Transition Tavistock. Vote here now to help make it happen. South Hill parish is just 17 minutes from Tavistock. 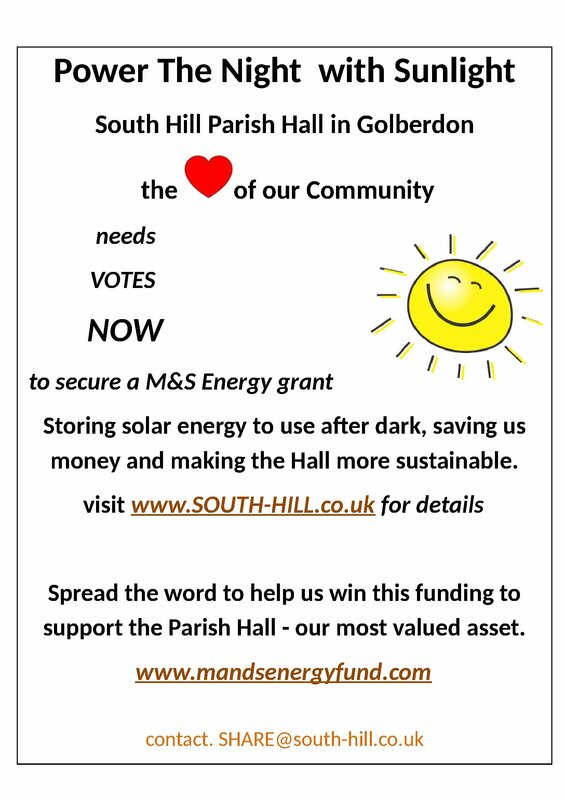 The Parish Hall in Golberdon village is the heart of all activities and needs money spent on it to keep it going. 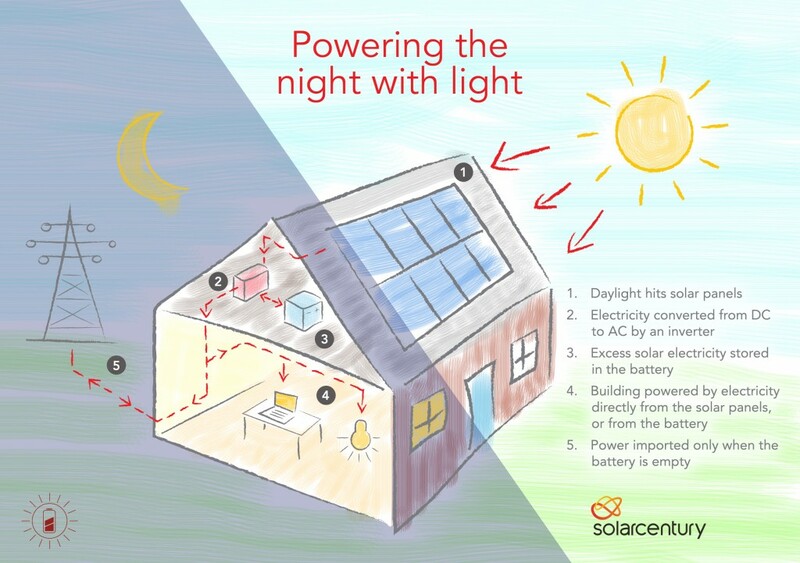 We aim to “Power the Night with Sunlight” … store the energy generated from the solar panels installed on the hall roof 2 years ago so it can be used when the sun isn’t shining. This will help with running costs and ensure the hall is sustainable for the future. We have successfully been shortlisted for a M&S Energy grant and now need VOTES, LOTS of VOTES to win the funding. We’re asking all our neighbours and friends and their friends to vote starting on Sept 4th through to Oct 20th 2017. We hope with all our efforts and your votes we can make a real difference in our community. THANK YOU IN ADVANCE FOR VOTING. We Need Friends. This entry was posted in Energy, News, TT Newsletters, Uncategorized on September 10, 2017 by Transition Tavistock. Tamar Energy Community is looking forward to this event. A great chance to catch up with what’s going on in the market. And you can find us in the Communities section. Let us know if you’re planning to go. A unique showcase of the emerging smart, decentralised energy system of the future – a radical shift in the way we power our lives that is creating huge opportunities. Smart Energy Marketplace is the biggest smart energy technology and renewable energy generation show in the south west. A jam packed event – with a unique exhibition, high level conference and informative talks attracting businesses, installers, developers, community groups and landowners to make for another lively and informative day. The exhibition features over 100 companies including smart energy technologies, renewable energy installers and developers, construction companies, training providers, manufacturers, consultants and advisors, energy assessors, financiers and banks. Find out more about exhibiting here. The high level conference provides the latest overview of the sector. Designed for those who are already developing projects or those looking to explore complex policy areas or opportunities. Find out more about attending here. 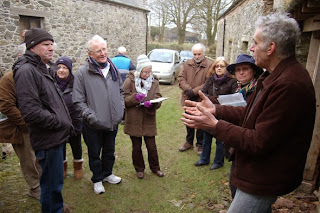 Please phone Emily to find out more about the event on 01392 494 399 or email estokes@regensw.co.uk . You can also book here and download a flyer here. This entry was posted in Energy, Events/Meetings, News on March 20, 2017 by Transition Tavistock. Unlocking the Power of Community is the theme for our annual energy fair on Saturday October 15th which will take place in Local Matters community space in Elbow Lane, Tavistock, from 10:00 until 15:00. This entry was posted in Energy, Events/Meetings, Uncategorized on October 9, 2016 by Transition Tavistock. This is very apt as we work to complete our Community Solar Project to put community owned solar panels on a number of roofs across the area. These solar roofs enable our host sites to reduce their energy costs and be renewable generators. 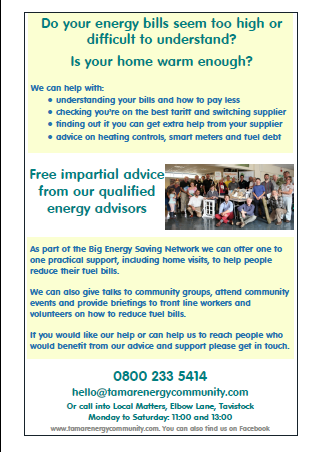 Any surplus is used to support fuel poverty and energy advice locally. The local community has come together to raise £110,000 to finance part of the project and we’ll be launching a community share offer later in the year. 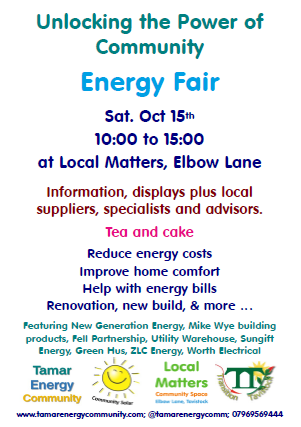 Our energy fair will be bringing together local leading local renewable energy suppliers, retrofit specialists and community energy and environmental groups from across Devon and Cornwall including New Generation Energy, The Fell Partnership, Mike Wye (natural building products), Sungift and ZLC Energy and The Utility Warehouse. Please come along, find out more about what we’re doing at Local Matters, talk to our exhibitors and learn about Tamar Energy Community’s first community financed project. Call or email us for more information. 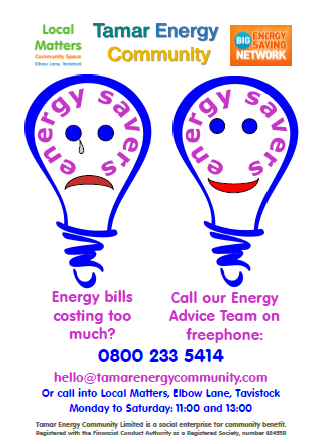 Email hello@tamarenergycommunity.com or call 07969 569 444. This entry was posted in Energy, Events/Meetings, News, Uncategorized on October 1, 2016 by Transition Tavistock. Our Energy Quizmas Tree is in the St. Eustachias church Christmas Tree Festival. Sunday Dec. 9th is the last chance to go and see the wonderful trees, 63 in all, and have a go at the quiz. This entry was posted in Energy, News on December 9, 2012 by Transition Tavistock.